> Intermediate Degree preferably in Management/Economics from a recognized University. > Bachelor’s Degree preferably in Management/Economics from a recognized University. > Bachelor’s Degree in Management/Economics from a recognized University. 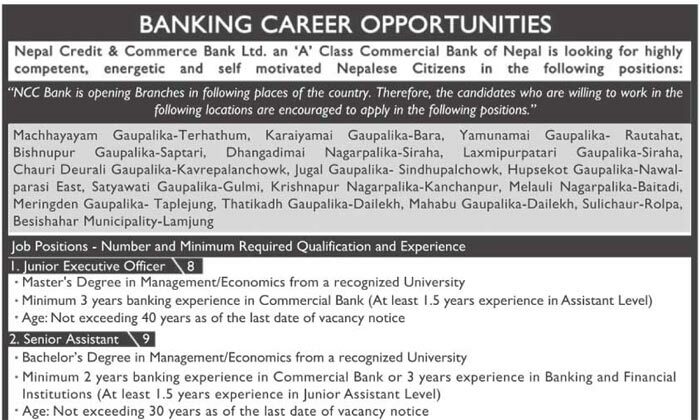 > Minimum 2 years banking experience in Commercial Bank or 3 years experience in Banking and Financial Institutions (At least 1.5 years experience in Junior Assistant Level). > Master’s Degree in Management/Economics from a recognized University. 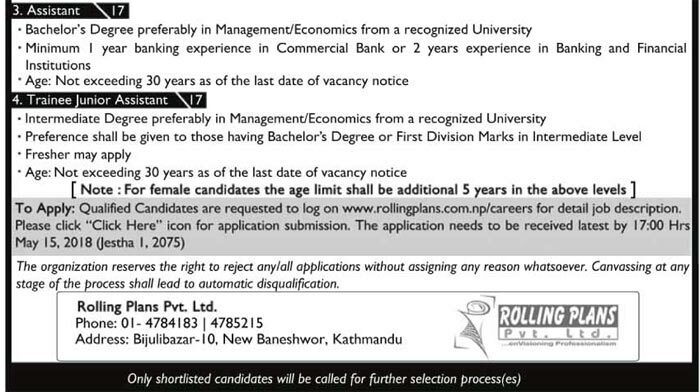 > Minimum 3 years banking experience in Commercial Bank (At least 1.5 years experience in Assistant Level). Application deadline for all above positions : Jestha 1, 2075 (May 15, 2018).